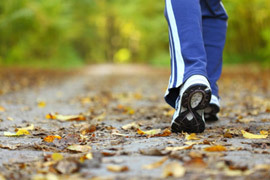 Why is walking such great exercise? On a very basic and banal level, the best answer to this question is.... because walking doesn't have to feel like exercise! Walking is a term that defies a narrow definition. It includes everything from a dash to the shops, to a hike up a mountain, to a meander around the park. At any pace or level of intensity walking is good for you because it fulfils the basic exercise criteria of being a physical activity that gets your muscles and heart-rate moving. Although strenuous or fast-paced walking (such as hiking or power-walking) will obviously burn more calories and build muscle mass more quickly, any increase in the daily amount of steps that you take will help you lose weight and tone up. What's more, it's an easy exercise to take up as it requires no specialist kit, is completely free, sociable, and doesn't put any undue strain on the body. How many calories will I actually burn? It's important to remember that everyone's body responds differently to exercise, and that the amount of calories you burn will depend on your body composition and weight. How do I know if I'm walking at the right intensity to lose weight? The optimal fat-burning walking speed is a pace at which your breathing is noticeable, but you are able to carry on a conversation. At this speed your heart rate will be working at about 60-70% of its maximum rate. The British Heart Foundation recommends that we walk 10,000 steps a day to achieve long term health benefits, and an average of between 12,000 and 15,000 steps a day to achieve successful and sustained weight loss. This means you will be walking most days of the week, and altogether walking for between 5 and 10 hours per week.